The caterpillars of the Lime Butterfly are often considered a pest of the domestic lime plant that is commonly cultivated as a garden plant. Used in Asian cooking, the green fruit of the lime plant is a common ingredient in many local dishes, usually as a garnishing. We have heard of the caterpillars of this species feeding on lime plants along the corridors at the 13th storey of our local public housing! 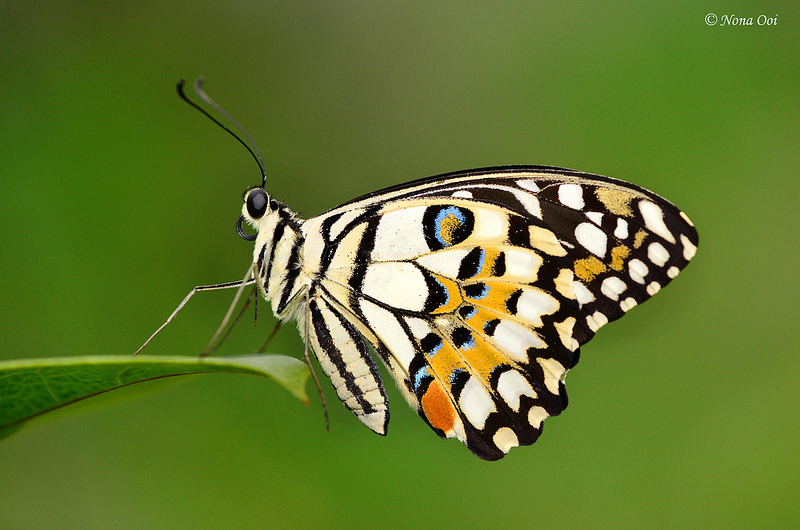 The butterfly is large and pretty, with black and yellow markings giving the butterfly an almost chequered appearance. The underside is predominantly yellow with black markings. 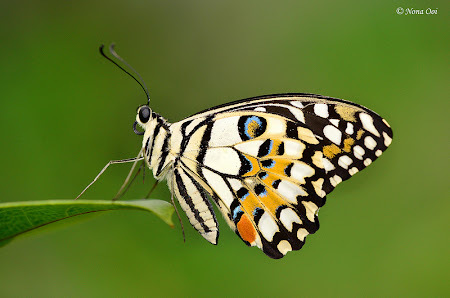 The Lime Butterfly is fast flying but can often be photographed whilst it is visiting flowers, puddling, or just perching on shrubbery to rest. This shot, taken by ButterflyCircle member Nona Ooi, shows the butterfly at rest.